In just under a year, George Kittle has quietly rejuvenated himself to become one of the National Football League’s most intriguing tight end prospects, a huge achievement for a fifth-round draft pick. The Wisconsin-born San Francisco 49ers player, who has already won the hearts of fans in the Golden State, is looking to add some shiny silverware to his collection in the coming years. George Kittle was born to Jan Krieger and Bruce Kittle on the 9th of October 1993 in Madison, Wisconson. He was raised on his family’s corn and soybean farm where he first learned how to play football with his father. For some unknown reason, Kittle attended three different high schools. First was Iowa City West High School in Iowa City, Iowa, and then Cedar Falls High School in Cedar Falls, Iowa. The third and final school he went to was Norman High School in Norman, Oklahoma after which he attended the University of Iowa. In his first year as a part of the Hawkeyes football team, Kittle was used as a utility player, playing in only 3 games and recording 5 receptions for 108 yards. In his second year, he recorded only 1 reception for 25 yards despite playing in three games. His fortunes changed in his junior year as he managed to play in 10 games, recording 20 receptions for 290 yards and 6 touchdowns. In his final senior year, George Kittle managed 22 receptions for 314 yards and 4 touchdowns in 9 games. George Kittle had to wait for two long days before he was certain he would become an NFL Player, as he was selected in the fifth round as the 146th overall pick by the San Francisco 49ers. 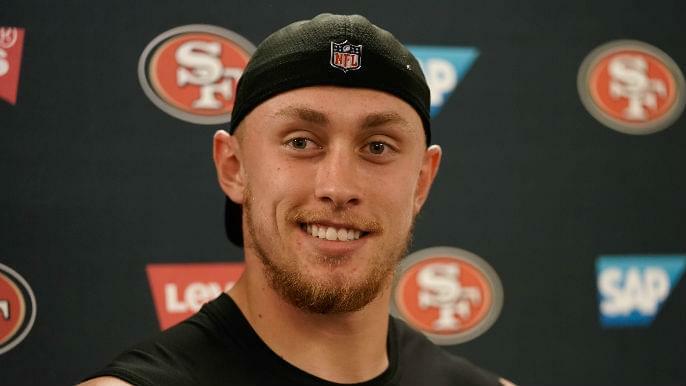 After training camp, Kittle was selected as a starting tight end for his team. He then went on to feature in 15 games, starting 7 and recording a total of 43 receptions for 515 yards and 2 touchdowns in his rookie season. George Kittle’s father, Bruce, is a former college football player who went on to have a career as a college football coach. Bruce played as an offensive tackle for the same school his son ended up attending, the University of Iowa. After graduating, he took a graduate assistant position on the football team, working under legendary football coach Hayden Fry. However, after a while, Kittle left the position to attend law school after which he became a pastor. After taking more than a few years away from the sport, Bruce returned to first coach his son’s high school football team before being appointed as the recruitment coordinator for the University of Oklahoma Sooners football team in 2010. George Kittle is engaged to his longtime girlfriend Claire Till, a 2016 graduate of human physiology from the University of Iowa. Like her future husband, Till was an athlete in college. She played as a forward for the school’s women basketball team while her man was a star on the football team. Following his selection in the 2017 NFL Draft, George Kittle put pen to paper on a four-year, $2.69 million contract with the San Francisco 49ers that came with a signing bonus of $298,287. This means that Kittle earns an average annual salary of $674,572. George Kittle’s battles with injury began well before he ever became an NFL player. His first injury was on the 15th of October, 2016 when he suffered a pedal foot sprain on his right foot in a college football game against Purdue University. He went on to miss two full games before becoming a limited player for his team in the rest of the season. As a full-time NFL player, Kittle suffered his first notable injury on the 1st of August, 2017. It was a thigh hamstring sprain which led to him missing about a week of training camp but he however recovered fully to participate in the season opener. His second injury was an ankle sprain which came on the 5th of November, 2017 in a game against the Arizona Cardinals. He went on to miss just one game before being able to again suit up for his side. His third most notable injury came in the 2018 preseason opener on August 9, 2018, where he separated his right shoulder. The injury is not regarded as a serious one and Kittle is expected to make a full recovery very soon. Hand Size – 9 1⁄4 inches (0.23 m).